This week we featured a party box from Healthy World, Healthy Child HERE. Each year we donate to the party box because it is a GREAT way to support a non-profit trying to improve the lives of children throughout the world. The mission of Healthy World, Healthy Child is to empower and education parents in protecting their children from harmful chemicals. Not only do they influence the folks in Washington, but they give fantastic tips on how to live a more chemical-free life. Any time I have had a question about a product, or I am looking for a product, they have answered my questions. They are attentive to questions and comments, and post great content on both their Facebook page and their blog. 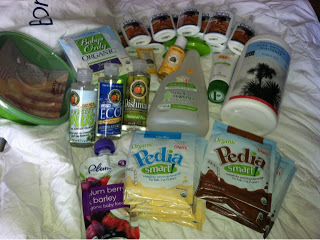 These little reminders really help me to live a more chemical free life. I also want to let you mamas know that this non-profit organization is ran by some of the nicest, most professional people you will meet. I have had the opportunity to work with them on a couple of occasions when I had an issue with my party box, and they were fantastic! We think they are a GREAT resource for information on living more chemical-free!! !